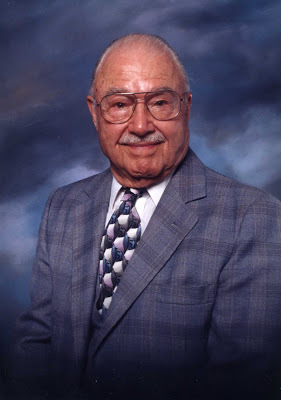 A memorial service will be held Friday, March 14, 2008, at 4:00 P.M., at Rose Drive Friends Church, 4221 Rose Drive, Yorba Linda, California, for longtime Grace Brethren pastor, Bible teacher, and Jewish evangelist Robert Elias Allen Miller (Robert E.A.) of Placentia, California, who peacefully went home to be with the Lord, surrounded by his children, on Thursday, February 28, 2008. He was 92. He was the oldest of ten children born to Robert Paul Miller and Anne Alverta Meyers. For more than 60 years, he was a minister in the Grace Brethren Church and with Chosen People Ministries. Miller attended Wheaton College in Wheaton, Illinois, graduating in 1935 with a Bachelor of Science degree in biology. He married Althea Marie Schwartz on September 3, 1935, and after a brief honeymoon, they settled in Ohio, where he attended Grace Theological Seminary. Upon graduation from seminary, he and Althea moved with their two young children to Tracy, California, where he served as a pastor for three years. When Robert and Althea were married, their life goal was to serve as missionaries in Africa, but when it came time to make the final plans in 1939, the United States government would not permit them to leave the country as first-time missionaries with two small children because of international unrest. So they began their ministry with the Brethren church in Tracy, California. In 1941 Miller accepted the call to pastor the Grace Brethren church in Martinsburg, Pennsylvania, where he also taught public school since so many young male teachers were called or volunteered to serve in World War II. In Pennsylvania four more of nine children joined the family. In 1949, the Millers moved Roanoke, Virginia, where Robert served as pastor of the Ghent Brethren Church. In 1956, the family moved to St. Petersburg, Florida, where Robert and Althea both taught at the Grace Livingston Hill Memorial School and Robert pastored a small church. In 1960, they moved to Glendale, California, where Robert served as pastor of the Grace Brethren Church. While in Glendale, Robert took a stand against anti-Semitism by successfully protesting the establishment of the American Nazi Party headquarters. In 1966, Robert and Althea joined the staff of The American Board of Mission to the Jews, now the Chosen People Ministries, as field missionaries, a call that moved them to Washington, D.C., where they served until 1972. They then returned to California (Orange County) where they continued their work with the Chosen People Ministries until their retirement in the early 90s. Robert continued to teach, conduct Bible study classes, and mentor young men right up to the end of his life. For some years he wrote teacher quarterlies for adult Brethren Sunday School classes. He also taught a weekly Bible study class for more than 25 years at a Seal Beach (CA) retirement village that is home to many retired Brethren church pastors and members. He was preceded in death by his wife, Althea Schwartz Miller, and his son Robert, Jr. He is survived by five siblings: Martha Lohnes, Jane Wilkins, Paul Miller, Carl Miller, and Wesley Miller; his eight children, William Ward Miller, David S. Miller, Dorotheann Barker, Sharon M. Lash, Paul K. Miller, Althea L. Miller, Ardyth L. M. Hallock, and Mark F. Miller; their spouses; and by 15 grandchildren and 15 great grandchildren. There will be a memorial service on Friday, March 14, 2008, at 4:00 P.M., at Rose Drive Friends Church, 4221 Rose Drive, Yorba Linda, California. In lieu of flowers, donations can be made to Rose Drive Friends Church Mission Fund at the above address, or Hospice Care of California at 377 East Chapman Avenue, Suite 280, Placentia, California 92870. To sign the online memory book, click here. I was nine years old in 1952 and after hearing a message from Pastor Miller, I felt the need to accept Christ as Savior. I hestitated and all week was most miserable. The next Sunday after the message was preached, Pastor Miller came forward to give an invitation but before he could do so I ran up front to where he was. "What are you up here for David ?" "I want to be saved". Because of this occasion I have always considered Pastor Miller my "spiritual father." I have thanked him over the years for being there for me as a child and leading me to Christ. I will thank him again someday when we meet in heaven. Pastor Robert Miller was always Uncle Robert to me, never Uncle Bob, always Uncle Robert. He was the oldest of the kids in his family. As I grew up, my dad, Ward Miller, would frequently tell me how smart his brother, Robert was, and Uncle Robert would tell me how smart my dad was. They were both right. When I was young we attended many Miller family gatherings at Uncle Wes Miller’s farm in Warsaw during the Grace Brethren Conference week. Uncle Robert, along with my dad, Ward Miller and the others, Uncle Paul Miller, Uncle Carl Miller, Uncle Wes Miller and Uncle Arnold Kriegbaum would enjoy fervent theological discussions. Listening in was like going to seminary in a large panel-debate setting without a moderator! They were all so passionate—really getting into it—then they would always depart with hugs and kisses! Uncle Robert was the loving Uncle that got right next you in a conversation—very close and personal. It was his way of saying you mattered to him. I remember enjoying snacks at his home as we stood and talked—I used to tell my wife that he got so close, if he were taller, he could chew my snacks for me! There was no getting away from a conversation with Uncle Robert! Not that I ever wanted to get away from talking to Uncle Robert. He was truly fascinating to talk to—he was so genuinely interested in my ministry and my life. But when we began talking about his ministry—wow—was that a wonderful wild ride. Uncle Robert was well-read, well-spoken and (here I go again) so passionate about his Lord, the Word and reaching people for Jesus—especially Jewish people during the later half of his life. If you never heard him present a Passover Seder—well—you missed the best! Uncle Robert was a dynamo of happy godly energy radiating from a small package--a little man with a huge heart for God and people.